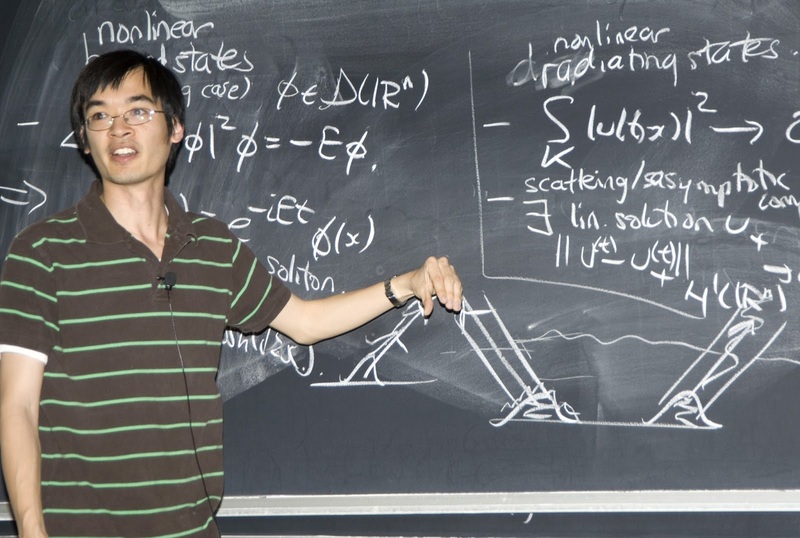 Terence Tao is known as the “Mozart of mathematics” and among the greatest mathematician currently active. He was born in Adelade-Australia of Chinese decent. When Terry was two years old his parents realised that he was different from other children. 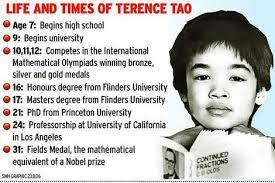 They saw him teaching five year old children to spell and to add numbers and, when they asked him how he had learnt these skills, he replied that he had been watching Sesame Street on television.At the age of nine, Tao commenced part-time studies in mathematics at Flinders University. By the time he was 16, he’d finished his science degree. He got his masters when he was 17 and his PhD at Princeton University at 20. Within his field, Tao is best known for for his work in twin-prime conjecture, which the French mathematician Alphonse de Polignac suggested in 1849. Go up the number line, circling the primes, and you may notice that sometimes a pair of primes is separated by just 2: 5 and 7, 11 and 13, 17 and 19. These are the ‘‘twin primes,’’ and as the journey along the number line continues, they occur less frequently: 2,237 and 2,239 are followed by 2,267 and 2,269; after 31,391 and 31,393, there isn’t another pair until you reach 31,511 and 31,513. Euclid devised a simple, beautiful proof showing that there is an infinite number of primes. But what of the twin primes? As far as you go on the number line, will there always be another set of twins? The conjecture has roundly defeated all attempts at proving it. When mathematicians face a question they cannot answer, they sometimes devise a less difficult question, in the hope that solving it will provide insights. This is the path that Tao took in 2004, in collaboration with Ben Green of Oxford. Twins are two primes that are separated by exactly 2, but Green and Tao considered a looser definition, strings of primes separated by a constant, be it 2 or any other number. 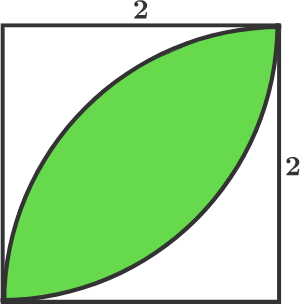 (For example, the primes 3, 7 and 11 are separated by the constant 4.) They sought to prove that no matter how long a string someone found, there would always be another longer string with a constant gap between its primes. That February, after some initial conversations, Green came to visit Tao at U.C.L.A., and in just two exhilarating months, they completed what is now known as the Green-Tao theorem. 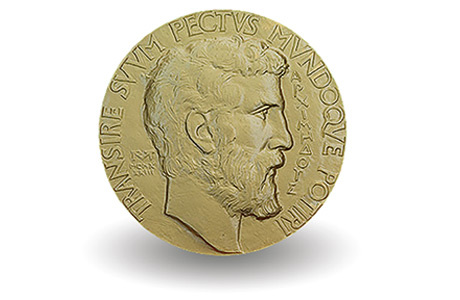 Tao has pages of awards, fellowships, prizes and medals to his name – most notably, the Fields Medal, the maths world’s equivalent of the Nobel Prize, which he received in 2006 when he was 31 “for his contributions to partial differential equations, combinatorics, harmonic analysis and additive number theory”. Around about then, people started to describe him as “the Mozart of math”.